Doncaster Rovers took another big step towards the League One play-offs with a well earned victory over Plymouth Argyle. Tommy Rowe set Rovers on their way to a fourth successive victory with a powerful seventh minute strike. Danny Andrew scored from a freekick for the second home game running just before half time to double the lead. 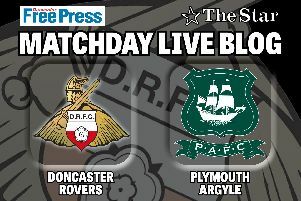 Plymouth pushed for a way back into the game but came up against a determined Doncaster defensive unit. The victory keeps Rovers five points clear of seventh-placed Peterborough United with games fast running out. Herbie Kane made a welcome and impressive return in the deep-lying midfield role and Rovers were infinitely better on the ball than they were at Bradford City the previous weekend. Mallik Wilks also did a sterling job as the central striker in the absence of John Marquis, while Paul Downing slotted in seamlessly as a replacement for the injured Tom Anderson. The visitors flew out of the traps and Antoni Sarcevic went close from their first attack but Rovers quickly sprung into life themselves. Wilks' header from James Coppinger's teasing cross hit the outside of the post before Rowe showed some neat footwork in the box and slammed a shot into the top corner after seven minutes. The lively tempo to the game continued but Rovers were more purposeful with their passing as Coppinger and Wilks both tested Matt Macey in the Plymouth goal. David Fox saw a shot deflected just wide at the other end and Downing had to produce a perfectly-timed tackle to prevent Freddie Ladapo finishing off a quick break. But it was Rovers who carried more of a threat and they extended their lead just before half time when Andrew’s free-kick from 30 yards out beat Macey at his near post. Rowe burst into the box but fired wide following the re-start, while Graham Carey wasted a decent opening for the Pilgrims on the hour mark. Argyle continued to plug away and Marko Marosi was forced into a brilliant stop to keep out Ruben Lameiras’s shot from the edge of the box. Substitute Alfie May should have put the game beyond Plymouth when he was sent clear by Kane but his shot sailed over the bar. Wilks also went close to a third but was denied by Macey, while May and Andrew both saw goalbound shots blocked in the dying stages. Rovers: Marosi, Blair, Downing, Butler, Andrew, Rowe, Crawford (Beestin 76), Kane, Coppinger (Smith 82), Sadlier (May 64), Wilks. Subs not used: Jones, Lewis, Blaney, Hasani. Plymouth: Macey, Threlkeld, Edwards, Canavan (Jones 82), Sawyer, Songo’o (Taylor 46), Fox, Carey, Sarcevic, Lameiras, Ladapo. Subs not used: Letheren, Smith-Brown, Wootton, Fletcher, Jephcott.